For someone new at flour less baking, wheat flour that is, can be a trial-and-error process. Flour, when used in baking, adds body, structure, and texture to baked goods. It often acts as a binder, because of the gluten, binding all the recipe ingredients together. When you remove the gluten or flour, you have to add something else in its place that will perform the same function. Here are some tips to help achieve better baking results when going flour less. To increase the nutrition value, substitute up to 1/4 cup ground flax seeds plus 1/4 cup water for 1/4 cup flour in a recipe (flax will absorb more moisture). To add more moisture to your recipe, add gelatin, extra egg or oil. Honey or rice malt syrup helps retain moisture as well. Honey works great when using coconut flour. Substitute brown sugar for white sugar to retain moisture. To enhance the flavor of flour less foods, add chocolate chips, dried fruits or nuts and double the amount of spices asked for in the recipe. For better structure, add dry milk solids or cottage cheese to the recipe. Replace evaporated milk for regular milk. Add extra egg or egg whites if your recipe is too crumbly. Don’t over beat or over mix since the kneading time or mixing time is shorter with no gluten to develop. You can use ground oats in place of flour, but you will also need bananas or eggs to bind the ingredients together. Eggs can replace many functions of gluten such as binding and enhancing texture and structure of the recipe. Two other starch-based products you can use to bind and thicken are guar gum and xanthan gum. They are interchangeable and used in small amounts, usally about 1 tablespoon. But these two binders can be expensive, and in place of them you can use corn starch, tapioca starch, or arrow root starch. Guar gum is extracted from the bean of the guar plant. The guar plant is native to Pakistan and India. The guar bean is rich in protein and used to feed cattle, and as a vegetable used in Middle Eastern cooking. 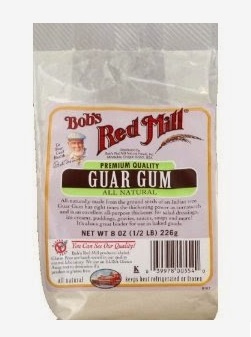 Guar gum is also used to help preserve food, and to help it retain flavor, texture and moisture. Guar gum is recommended to use when baking with coconut flour, as this type of flour can case dryness to your baked. Xanthan gum has a substance called polysaccharide, which has the ability to form a gel and bind many times its weight in water, making it a very valuable food thickener. 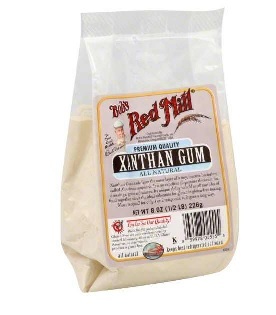 If you are allergic to corn products, then it is recommended not to use xanthan gum, as it is derived from corn. But it can also be fermented by using wheat, dairy, or soy as well. Just read the ingredients label to see how it was made. The key to flour-less baking is to experiment. You may have to try different ingredients or amounts to get the flavor and texture you want. Now for our featured recipe: Gluten-Free Chocolate Peppermint Cupcakes. Place oats in a blender and grind until fine. Add ground oats, sugar, cacao, baking powder and salt in a medium bowl. Whisk well. Add the mashed banana, oil, milk, apple cider vinegar and vanilla. Continue to whisk until smooth. Divide batter among the 12 cupcake liners and bake for 20-25 minutes or until they start to firm on the top. Let cool completely before frosting. Add icing sugar, cream, peppermint extract and green food coloring, if using, to a medium sized mixing bowl. Use electric mixer to blend until smooth. Add more cream, a little at a time as you’re mixing to create the consistency you want. After you have frosted the little cakes, arrange on a dessert plate, and serve with milk, coffee, or your favorite dessert beverage. If you like gluten-free recipes, you will also enjoy Gluten Free Tropical Carrot Cake. This entry was posted in Dessert, Gluten Free and tagged Baking, Baking powder, Cupcake, dessert cake, Flour, flour less baking, Food, gluten, Gluten-free baking, Gluten-free diet, guar gum, Recipe, recipe ingredients, Sugar, wheat flour, Xanthan Gum. Bookmark the permalink. Thanks Roger. You can really make the cupcakes in any flavor you like. Such as replacing chocolate with coffee as well as the frosting. The cup cakes look scrumptious. 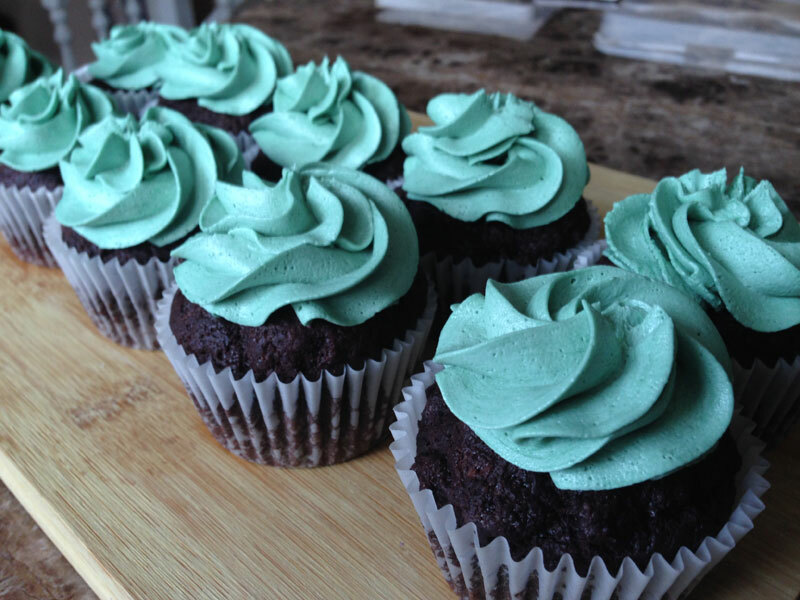 I think chocolate mint would be my choice for frosting. This gives me hope that gluten free doesn’t have to be the end of culinary delights and baking. I found gluten free lasgne noodles and so much more that I was afraid that I would have to give up at my local store. Thanks for the great recipes. Thanks Honey. I think coffee-mocha would be a great flavor for the cake and frosting as well. Thanks for stopping by and commenting as well. I am glad Jackie the recipe is appealing to you and thanks sharing it with a family member.